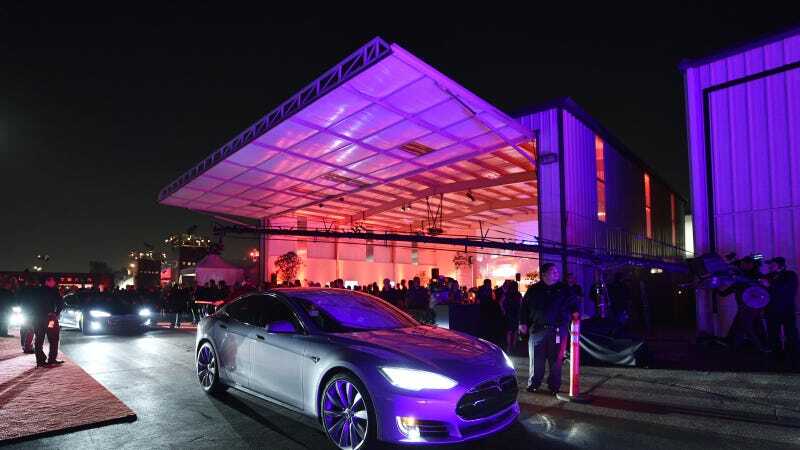 Tesla has only had a few extravagant launch events in its 12-year history. Tonight is one of them. On Tuesday night, Tesla, the electric car and energy storage company headed by Elon Musk, will launch its third vehicle, an all-electric SUV called the Model X. After months of suspense, little is still known about the crossover SUV, which follows Tesla's Roadster and Model S cars. The Signature Series, fully-loaded version of the Model X will cost $132,000, just a little more than a comparable Model S sedan, the standard version will cost closer to $75,000. It will have 'falcon wing' doors that open vertically and three rows of seats. While the rollout for this new SUV has been anticipated for years, the timing is especially serendipitous. Arriving almost within the same news cycle as Volkswagen's crippling scandal—in which the company admitted that it had programmed 11 million of its diesel cars to cheat emissions tests—offers a welcome boost for Tesla. Car owners are both angry at and wary of car makers, feeling betrayed by one of the oldest and largest car manufacturers in the world. The potential for a paradigm shift in the automobile industry looks much more feasible from a public relations standpoint than it did a few weeks ago. With Apple planning to enter the electric car race within the next half decade, the stakes have never been higher. For the moment, electric cars are still struggling to break into mainstream car culture in the United States, something Musk is very much banking on with Telsa and the company's forthcoming Gigafactory in Nevada that will make the lithium-ion batteries for the fleet. The factory is slated to be completed in 2017, with a planned production rate of 500,000 cars per year shortly thereafter. Cheap gas is also causing some short term growing pains, as electric car sales have slowed in recent months. At the same time, interest in larger vehicles, such as trucks and SUVs, is growing. According to BloombergBusiness, the Model X will be competing primarily with premium SUVs largely made by German automakers, such as the Audi Q7, the BMW X5 and the Porsche Cayenne. In response to the Volkswagen scandal, Peter Altmaier, chief of staff to German Chancellor Angela Merkel, called upon German carmakers to prove they are still leaders in the industry by outdoing Tesla in the emerging EV market. As ExtremeTech reports, the Model X should have the high-end, electric SUV market all to itself for at least a year, when Audi may start shipping its Q8 E-tron crossover SUV. These crossovers combine the sport utility vehicle appeal with a car platform, making them more practical for so-called "soccer moms" and other suburbanites that value space and versatility. They also open up possibilities to road trip enthusiasts, assuming enough electric car charging stations can be installed at regular intervals throughout the country. The 90 kilowatt-hour battery version of the Model X is projected to have a range of roughly 250 miles. One big plus here: Tesla offers free long distance travel on its Supercharger network of charging stations. Musk, known for his ability to seize the moment and affinity for the big stage, seems to realize the opportunity created by the current negative attention centered on diesel vehicles. Last week he said that what the Volkswagen episode reveals is that "we’ve reached the limit of what’s possible with diesel and gasoline." "The time has come to move to a new generation of technology," he said. Katie Fehrenbacher, a senior writer at Fortune covering the electric car industry, thinks this will be one of Tesla's "most important events in months, and potentially years." "The Model X is a very important car for Tesla," she recently wrote. "The company is using it to transition into selling multiple products (not just its highly-acclaimed Model S), to attract new kinds of customers (many of them women), and to significantly expand its California factory’s production."